WASHINGTON, D.C.—On the last Saturday of April, I—along with a handful of media, actors, and “family and friends”—put on seasonally inappropriate formalwear (it was 90 degrees and cloudy) to travel as close to the Trump White House as I’ve so far dared. We were going to watch Samantha Bee cook. 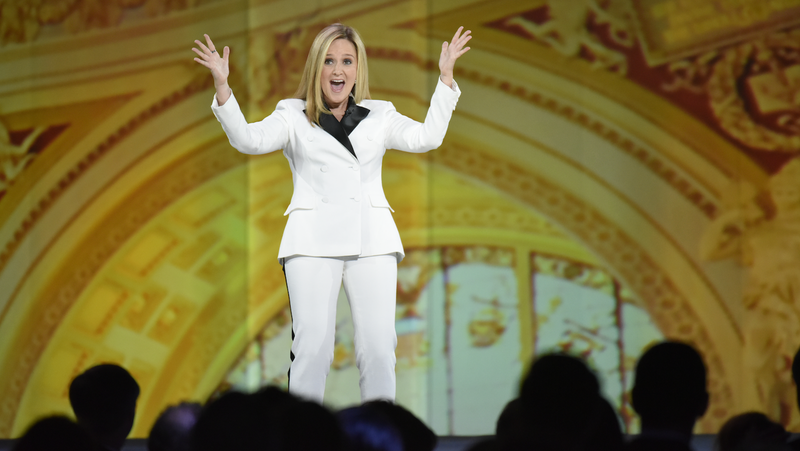 Bee’s Not the White House Correspondents’ Dinner, held at D.A.R. Constitution Hall, was intended to be the first ever counter-programming to the actual White House Correspondents’ Dinner—a night where the press has typically schmoozed with their subjects, celebrities and governmental officials alike, in a dinner that roasts the establishment as it celebrates it. And while the WHCD happened (rather uneventfully, with comedian Hasan Minhaj delivering the keynote roast), the NWHCD felt like its own thing—one dedicated to honoring and celebrating something that I forgot you could honor and celebrate: The Media, with all proceeds going to the Committee to Protect Journalists. Of course, I, a member of the media, was basically the show’s target audience, in addition to the media-sympathetic subgroup of the left (because their uncles are all Post columnists), liberal comedians (there are no conservative comedians), and former Clinton campaign staff. Bee was the fluffer and we were the fluffed, and by the end of the evening I had developed and sustained a Cinemax-worthy erection for the power of the work my colleagues do. I was seated as far from the stage as could still be considered “in the VIP section” at a table with Jia Tolentino, former Jezebel and current New Yorker writer, GQ’s Taffy Akner, a couple Daily Beast staffers, David Cay Johnston, the guy behind the Rachel Maddow tax return scoop, and a few others. When Bee made a joke about Maddow’s long preamble to the tax dirt, everyone at our table looked at him and smiled encouragingly. It felt really nice. The event kicked off with a cold open mock-press briefing from my career icon and Jezebel patron saint C.J. Cregg—again, Bee knows her audience—attempting to take questions from the sorts of people who populate Trump pressers nowadays: in this case, it was a member of Opus Dei, a Breitbart reporter/men’s rights activist, “the bold-faced red font email alert for America’s uncles.” Next was an opening performance from Peaches (which, from my seat, looked like Robyn, so much so that I screamed, “IT’S ROBYN!! !” at nobody), and a traditional opening monologue from Bee. And I, already halfway into my second wine of the early afternoon, couldn’t help but blubber a little bit. It! Is! So! Hard! To! Be! Me! But actually, it kind of is. The segments were all pithy and cathartic, with Bee and her excellent writers bearing witness to many of the frustrations that my coworkers and I have encountered over the last year or two. Highlights of the evening included a Steve Buscemi-hosted examination of the facts (“What is facts?”), a Fox News In Memoriam of Roger Ailes and Bill O’Reilly (“two media titans who were snatched—sorry—taken from us far, far too late,”) and an unexpectedly moving imagining of what the WHCD might look like if Hillary Clinton had won. But the strangest part of the evening was when Will Ferrell came out as George W. Bush to celebrate his new, revised legacy as second-worst president of all time. It was jarring as it was appropriate, to be here, at an alternative WHCD because the president, who is Donald Trump, refused to attend the real one, because his feelings are easily hurt, and because he didn’t want to go to a party he wasn’t wanted at, while watching an early-2000s Saturday Night Live impression of a man we used to hate, by a man who has become so famous he doesn’t really do impressions anymore. It seemed increasingly obvious, in that moment, that we’re trapped in a computer simulation that’s glitching, cobbling together disparate bits of pop culture into an uncanny, dysfunctional government prop. In his monologue, Ferrell-as-Bush likened the state of being a journalist to that of being on the Titanic. It was a bit over the top, sure, but the impending doom felt exactly that real. It was reminiscent of the “Rally to Restore Sanity and/or Fear,” co-hosted by Jon Stewart and Stephen Colbert in 2010, when liberals gathered on the Mall to share grim laughs about the war we were in. Why were we all in this fancy ballroom celebrating the press, something that can be, like anything else, invaluable as much as it is corrupt? Especially when the large portion of the country who has rejected the ability to see the media with any nuance wasn’t even paying attention? Were we applauding ourselves as our ship was sinking? Why was it so muggy and gloomy in April? After the show, Jia, Taffy, and I walked through the National Mall in our black tie—we had a few hours to kill before I would drink myself nearly to blackout level and humiliate myself in front of a showrunner who’s work I usually can’t stop talking about. Surrounding us were the dregs of the Climate March, also held that day, and the lawns were littered with tired protesters holding crinkled signs; the drone of an activist calling the few remaining crowds to action echoed across the Mall. It felt like we were in the Hunger Games, we agreed as three helicopters dipped below thick clouds that looked like they would open up at any second, and we were in the Capitol.